They told him it couldn't be done, that teaching at a business school was an academic dead end for a social psychologist whose pedigree included a Princeton doctorate. 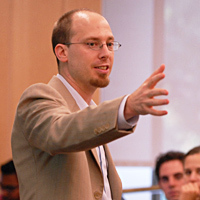 Before Adam Galinsky began his tenure at the Kellogg School in 2002 as an assistant professor of management and organizations, some warned that the move spelled doom for his research aspirations. "In a business school you can't teach research," the naysayers told him. "What students there want are war stories and case studies." But Galinsky, today the Morris and Alice Kaplan Professor of Ethics and Decision in Management, says these stereotypes are unfounded — at least at Kellogg, where intellectual depth and experiential learning are integral, and where teaching and research are complementary strengths. The school has proven an engaging environment, for Galinsky and his students. He has embraced the challenge of converting theory into valuable practical tools and finds that his students respond well to good research because they know how important it is for managers to identify, interpret and predict patterns. 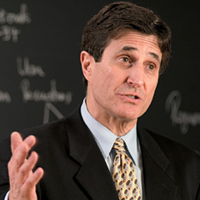 At the same time, Galinsky's research into power dynamics, ethics and negotiations has benefited by his classroom performance. Even a one-off lecture he delivered during a Kellogg global business course led him to consider the link between international living experiences and creativity. "I never would have thought of the idea without the teaching, and now my teaching is better because I've done this," he says. Galinsky has jumped on the bandwagon in the Kellogg School's decades-long research approach to create knowledge that solves real problems. When combined with the range of academic strengths at Kellogg, graduates emerge ready to undertake challenges in many areas. Ali Babacan '92, minister of foreign affairs for the Republic of Turkey, underscored this point during a recent visit. "Kellogg was crucial in my career and life," said Babacan, a former student of Dean Dipak C. Jain. 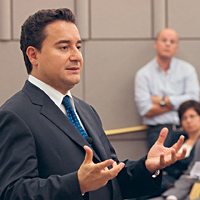 Babacan said the education propelled his success in business and politics. "Management is a global concept Š for any situation and setting," he said, adding that the diverse Kellogg student body and the school's team-oriented philosophy offered him great benefits. Today, he is a key player negotiating Turkey's accession to the European Union and says that government is an arena where MBAs can have impact. "Knowledge we learn at Kellogg is applicable to many different fields; [this education offers] many tools that open many doors," said Babacan. 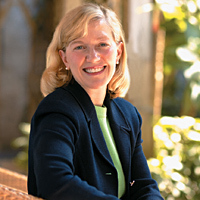 Throughout her career, including roles as president and CEO of Kraft Foods Inc. and, today, as senior adviser to McKinsey and Co., Betsy Holden '82 has tapped her Kellogg knowledge and network. Her marketing education began with an "unbelievable all-star team" of professors like Brian Sternthal, Philip Kotler, Bobby Calder and Sidney Levy. Sternthal's advertising class, along with Lakshman Krishnamurthi's marketing research course, remain highlights. "Sternthal's class really prepared us for the things we would be doing after graduation. It wasn't just advertising, but offered a broader perspective and a lot of brand management fundamentals," says Holden, who sits on the Dean's Advisory Board. As a Kellogg student, she participated in the General Motors Marketing Competition. Her team won. "There were about 25 of us and we worked with most of the Marketing Department, though the effort was student driven. It was an incredible educational experience," she recalls, adding with a laugh that the professors told students "win or don't come back." After graduation, Holden continued winning, counting among her successes the launch of DiGiorno Rising Crust Pizza for Kraft in 1995. She called the experience "a textbook example" of applying marketing theory and executing it extremely well. 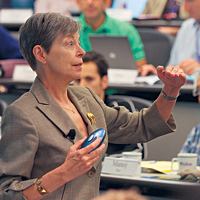 She had learned the frameworks at Kellogg more than a decade earlier, proving, she says, "this education has staying power." "I used all the principles we learned about market structure, creating a new brand, positioning, order entry." Holden also sought advice from faculty members during the launch. Since then, she has returned to Kellogg nearly every year to talk to students and professors, sharing challenges facing practitioners. She even turned the DiGiorno experience into a case study that she presented during marketing Professor Alice Tybout's executive education course. "It showed how all the pieces came together in terms of pricing, positioning and new product strategy," says Holden, who tells students and alumni to maintain a lifelong relationship with Kellogg. "Get everything you can out of the Kellogg experience, but be prepared to give back too," she says. Holden continues doing so: She was an Executive in Residence last year and is helping lead a Kellogg Innovation Network (KIN) summit in November, an event that includes alumni, members of the Dean's Advisory Board and corporate partners. "I think people should stay involved with the school," she says, "because all of us would say that Kellogg played an incredibly important role in our lives and in our business success."